One hundred and sixteen years. 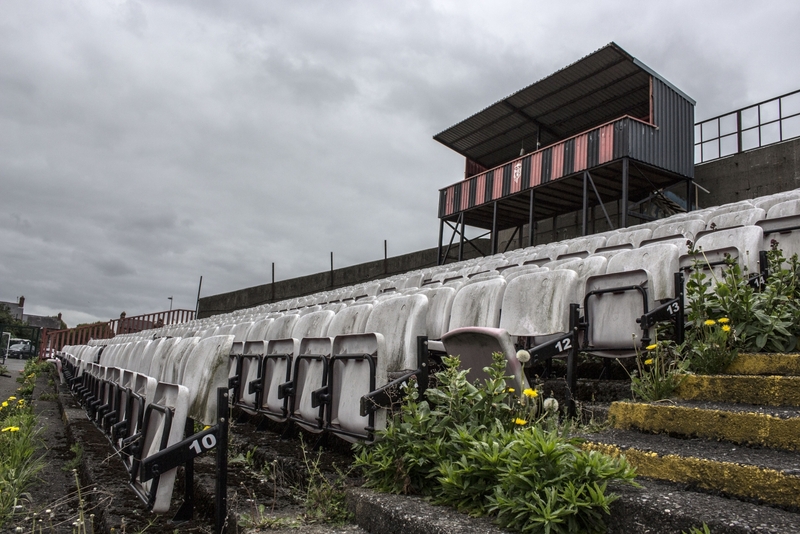 With every step taken beneath the stand on the Connaught Street side of Dalymount Park, there is an eerie echoing sound of crunching glass and rubble. There are old turnstiles filled with empty paint cans, bottles, and bags of concrete mix. Fallen branches and overgrown weeds surround an abandoned shopping trolley with a brick inside; there are dumbbells, parts of what once were seats scattered, and graffiti – none of which is football related – everywhere. Maybe it’s confirmation bias in effect and you have to know it already to feel it, but despite its current state it’s hard to escape the feeling that this is a place that matters – or at least did. Even when exploring what now appears to be no more than the skeleton of any abandoned building, it is hard to overcome that sense. This is not just a defunct site that has since been vandalised; this place had – has – its own life, its own character. It is more than the purpose that it serves. 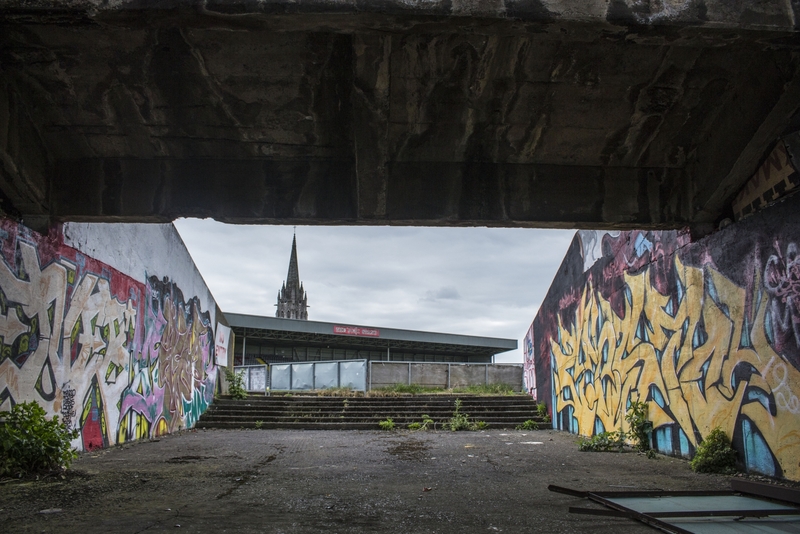 Looking back through what once served as an exit, you begin to see signs of what Dalymount Park is – a football ground and home to Bohemian Football Club. Beneath the towering St. Peter’s Church, the Jodi Stand comes into sight, the only of the four stands that is open each week. The terraced end and the Connaught Street side are closed and the Des Kelly stand opens on occasion, but it is usually just the one. In truth, there isn’t a need to open more. Bohs’ attendances averaged just over 1,600 during the 2016 SSE Airtricity League of Ireland season, according to Extratime.ie. It wasn’t always like this. Dalymount Park is the home of Irish football and its current condition serves as a harsh but almost poetic reminder of the state of the domestic game here. In the past, Dalymount has seen almost 50,000 people crammed inside and has hosted many of football’s greats, as well as some of music’s. Thin Lizzy and the Boomtown Rats have played there, as has Bob Marley in 1980, but Dalymount has always been, first and foremost, a place for football. Bobby Charlton and England played in front of around 48,000 there in 1957, as did Pelé before 30,000 with Santos in 1972. Some more modern greats have also graced the Phibsboro venue as well; from Zinedine Zidane to Ruud Gullit and Marco van Basten, Dalymount has seen plenty of the game’s finest overseas players. Of course, some of Ireland’s own have played there as well, namely Liam Brady and John Giles. But Dalymount Park is not just special because of those high-profile names. It is special in itself. It is a unique venue that is representative of those that frequent it. Even more than most football grounds, Dalymount has its own identity. From the club graffiti outside and in, to the Phil Lynnot mural, its character is undeniable. The eccentricity of some Bohs fans is seen on any given Friday evening with a visit to the club bars beneath the Jodi Stand, which provide a place for fans to enjoy a drink before and after matches. More so, they even act as a place where supporters can celebrate life milestones. Dalymount Park is more than a place to watch football for so many; it is a home from home. “Unless you’re a Bohs fan it’s impossible to explain what it [Dalymount] means,” explained Jordy O’Reilly. “What makes Dalymount special isn’t just the football. It’s the floodlights, the old stand, seeing the same faces each week. It’s going to the bar after the games. We lost the first game of the season here 4-1, but in the bar, it was like we had won 4-1. 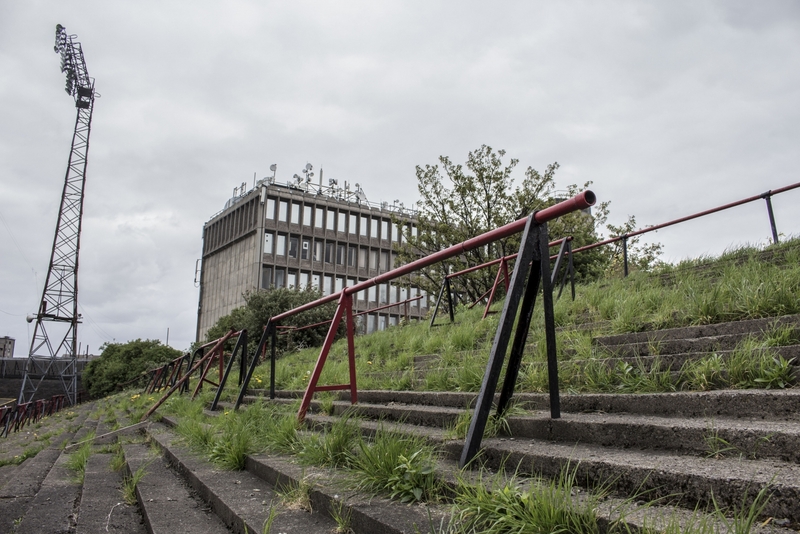 Sadly, the end of Dalymount Park as we know it is edging ever closer. Work to transform the ground into a €20 million modern design with a capacity of 10,000 is expected to begin in either 2018 or 2019. 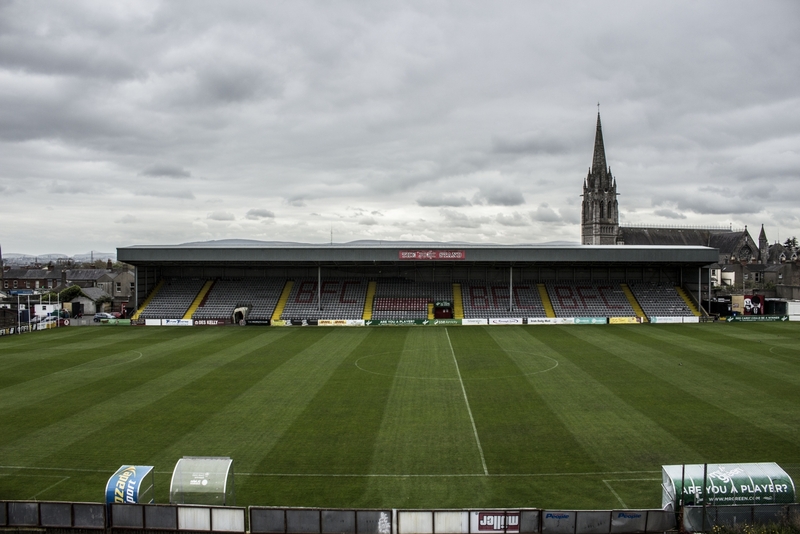 With that, Bohs will play their home games down the road in Tolka Park – current home of Dublin rivals Shelbourne, with whom they will controversially, share the redeveloped Dalymount. 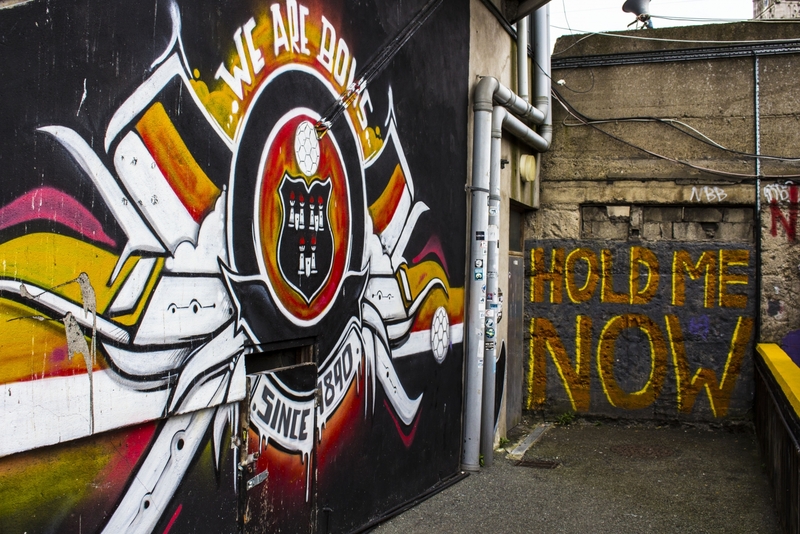 As hard as it is to accept and even more so to admit, most agree that the redevelopment is needed, but they can take solace from the fact that Bohs’ home will remain on the same site. “I think that on balance an upgrade to the ground is necessary,” John said. “The Jodi stand is a decent stand, but the rest of the ground is quite tired. I’m glad that the club will stay in Phibsboro, which I think was a price worth paying for losing ownership of the ground. This agreement, though widely shared, is far from universal among Bohs fans, with many fearing what is to come with the planned redevelopment and hoping to cling on to what they have for a little longer. “Undoubtedly a new stadium won’t feel the same as the current ground,” Mark added. “Personally, I hope we continue to play in the current ground for a few more years. The famous floodlights will be gone, but the club are hoping to bring back the days of competing for major honours. After all, Bohemian FC are one of Ireland’s biggest clubs. “The club is looking upwards,” added Jordy. “Once we get into the new ground we will be looking to get back to where Bohs belong – competing in the league.